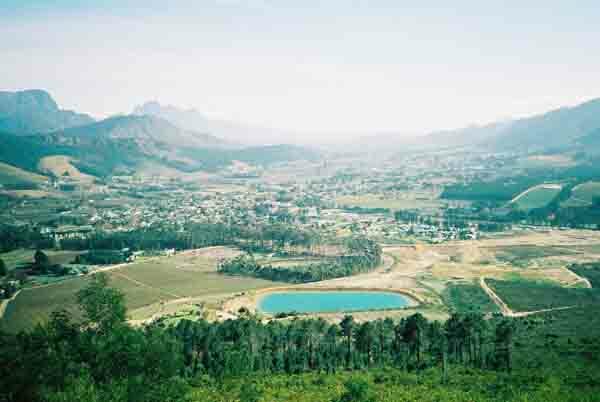 Franschhoek is a small village just 45 minutes from Cape Town. It was established way back in 1687 when Simon van der Stel and 23 other men visited the area after travelling over Helshoogte from Stellenbosch. Van der Stel named the valley Drakenstein (Dragon Rock) . Through this lovely valley flowed the Berg River and van der Stel and the other pioneers established 50 hectare farms along its banks. At this time the Huguenots in France were being persecuted for their Christian beliefs. A number of them escaped and made their way to the Cape where they established themselves in the valley in 1688 . 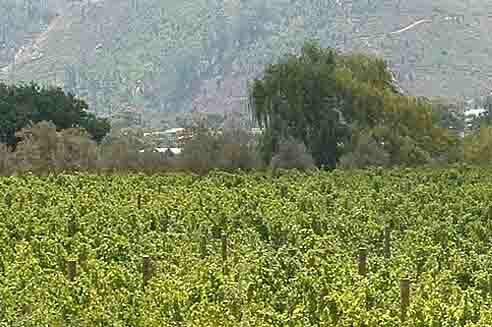 They were expert farmers and brought with them a number of grape varieties which they started to farm with in the valley. 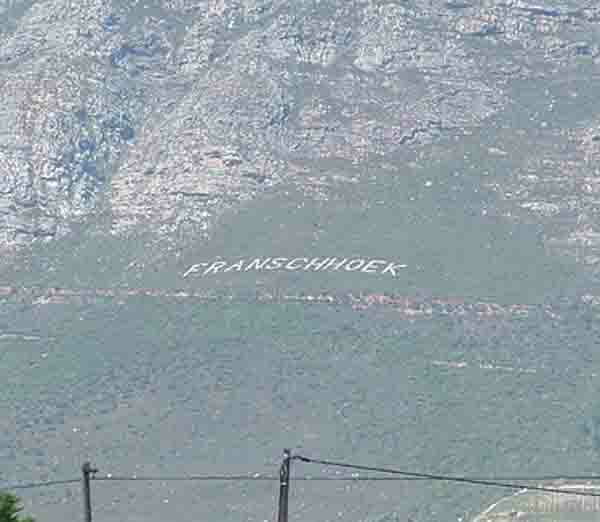 Today Franschhoek is well known for it”s excellent wines. Driving through Franschhoek you will notice that most of the farms still have their old Huguenot names. There are twenty-one wine farms which include some of South Africa's most well known names. Some of these farms produce South Africa's top wines. Wines produced range from superb whites such as Sauvignon Blanc, Chardonnay, Semillon and Chenin Blanc to the rich reds of Cabernet Sauvignon, Shiraz, Pinot Noir and Merlot. Many of the wine farms are open daily for wine tastings. Franschhoek is not only known for its wines but also for its restaurants. Eight of South Africa's "Top 100" restaurants are found in Franschhoek. When visiting the area take some time off to savour the hospitality where there is a choice of 28 restaurants to choose from. Not only are there restaurants, but a host of shops and galleries which providie a large variety of antiques, artworks and interesting bric-a-brac to browse through. A visit to the Huguenot Museum and Monument is a must. 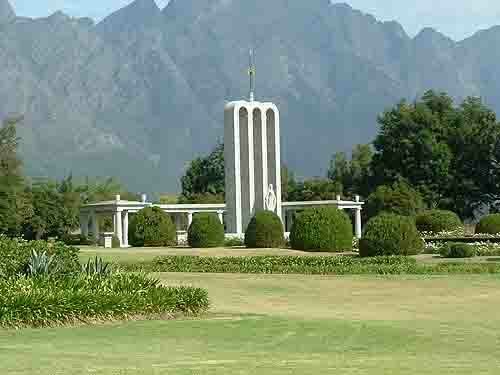 It was constructed in 1938 to commemorate the 250th year of the Huguenots' arrival in the valley and its theme is the Huguenots' escape from religious oppression, and their contribution to the development of the valley and its surrounding areas.. Franschhoek valley is one of the most beautiful in the Cape. It is surrounded by mountains covered with trees. The valley itself is filled with vineyards and Cape Dutch farm houses all of which are in pristine condition. For a weekend in the country Franschhoek is the ideal place to visit. It has plenty of accommodation where one can relax in the beauty of the valley. For entertainment there are hiking trails, bike trails through the forests, and of course, the wine route where one can taste most of the wines produced in the valley. The main street will keep one busy for hours as you explore the small shops that abound. A drive up the Franschhoek Pass will give you some fine views of the valley far below and if you continue over the pass the road will take you through some spectacular scenery in the mountains above Franschhoek. This village with its fine history is not to be missed.